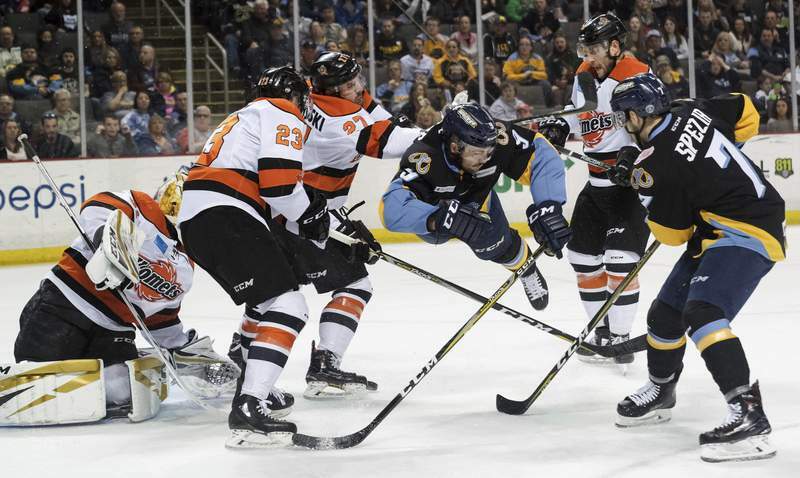 Photos by Jeremy Wadsworth | The Blade Toledo forward Chris Crane goes airborne in front of the Komets' net while taking a shot on goal during Game 2 of the Central Division semifinals Saturday in Toledo. 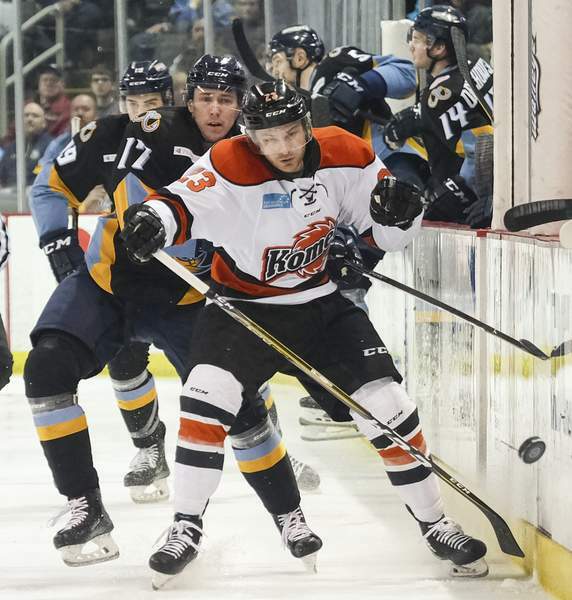 TOLEDO – The Komets' roster is laden with offensive playmakers – guys such as Brady Shaw, Shawn Szydlowski, J.C. Campagna, Justin Hodgman, Jake Kamrass and Marco Roy – but it doesn't look like it right now. 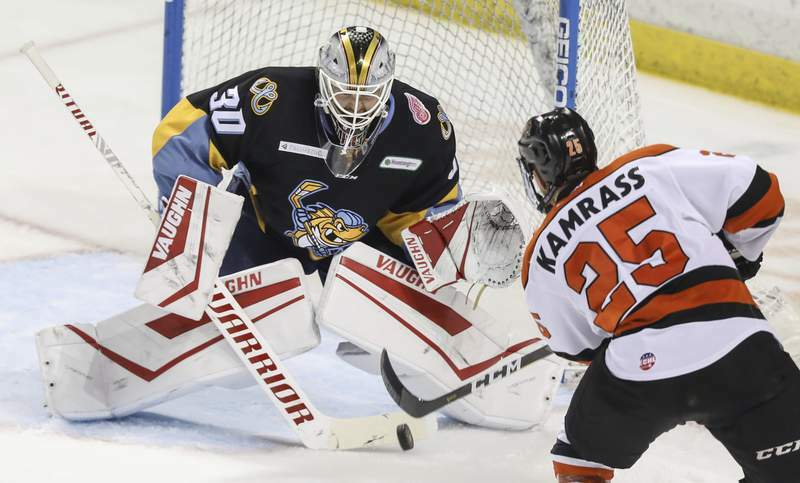 The score would have been worse if Fort Wayne goaltender Zach Fucale hadn't come up with several terrific saves in stopping 37 shots, but he didn't get much help as the Komets suffered their first shutout in the playoffs since the Jeff Lerg-led Walleye ousted them from the 2017 playoffs in Toledo. 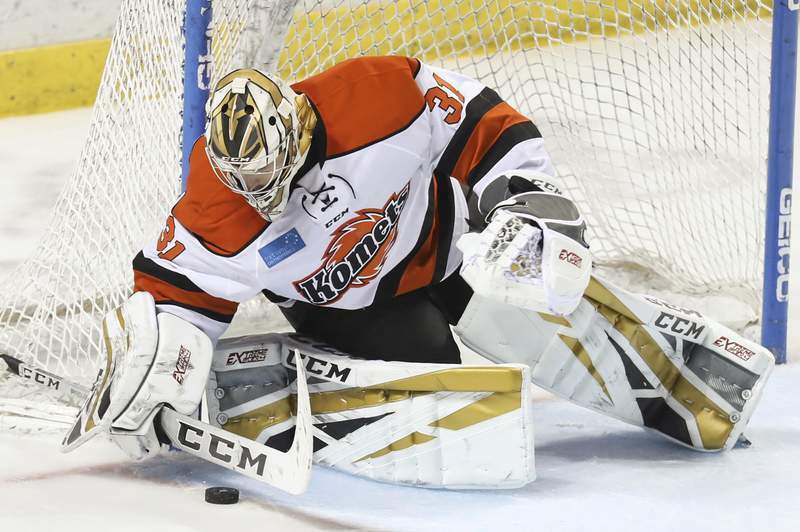 That was Pat Nagle's final game in net for the Komets, and he was on the other end of it Saturday, stopping 23 shots for Toledo. 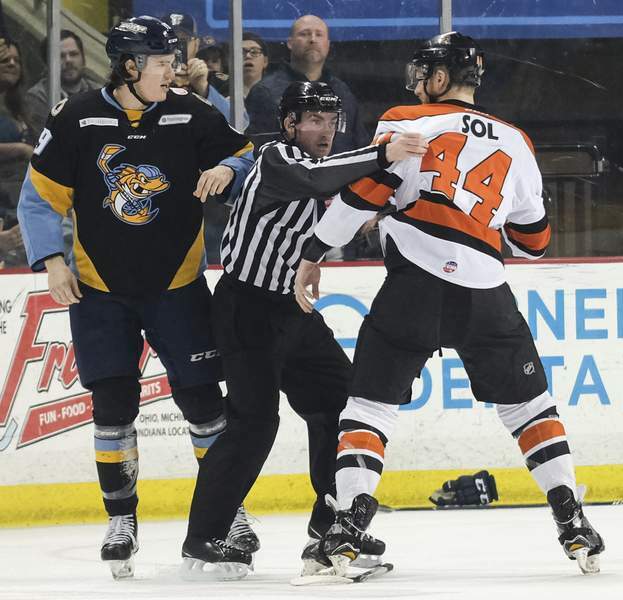 The game really turned in the second period, when Fort Wayne's Ryan Lowney checked Dylan Sadowy to the ice, setting up a 10-player melee that, strangely, saw Sadowy escape without any of the three penalties from referees Chris Pontes and Jeff Parker. On the ensuing power play, Sadowy's crossing pass set up Berschbach for a goal and a 3-0 lead at 2:24. The Walleye's next three goals were all on power plays.